These are the perfect party appetizer. 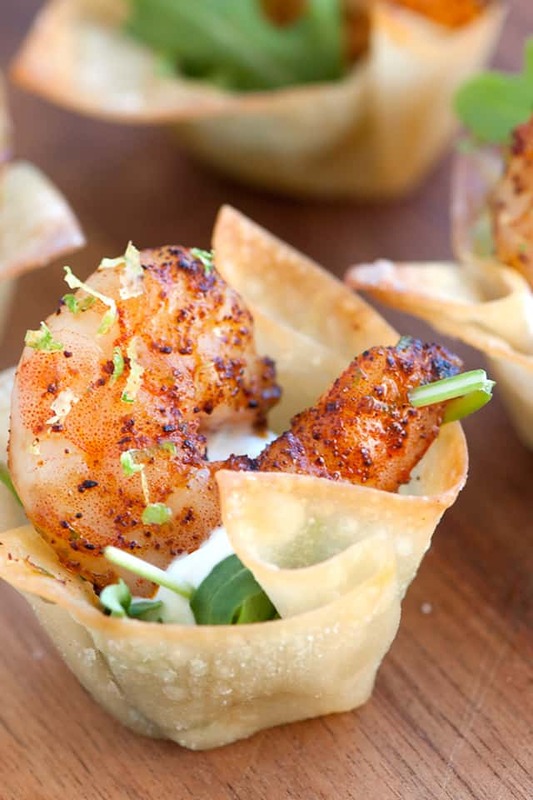 Wonton wrappers are baked in the oven until crisp, filled with arugula, a lime sour cream, and then topped with a big juicy chili-lime baked shrimp. The shrimp are a little spicy from chili powder, the lime brightens everything up and the arugula keeps the whole thing fresh. You can make the wonton cups in advance, but assemble the cups with the arugula, sour cream and shrimp just before serving. Wonton Cups with Shrimp Recipe Update: We shared this recipe on Inspired Taste a few years back and it has become one of our more popular recipes. Since originally sharing the recipe, we have made some changes to bump up the flavors of the shrimp cups. We loved them before, but now they are full of flavor and still just as simple to make. Changes include adding a lime sour cream, swapping regular chili powder for ancho chili powder and lightly seasoning the wonton cups before baking. 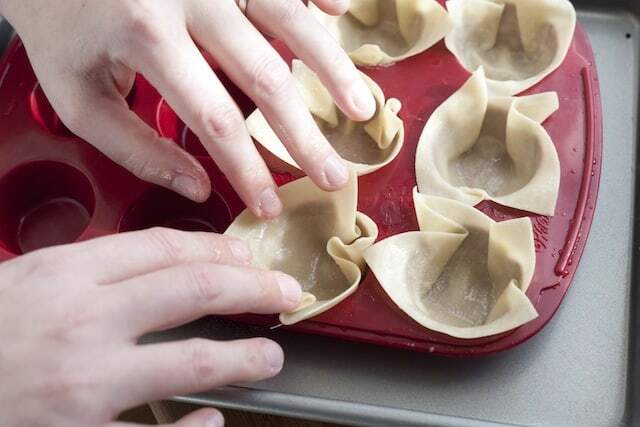 Prepare wonton shells: Lightly brush wonton wrappers on both sides with olive oil. Lightly season one side with salt. 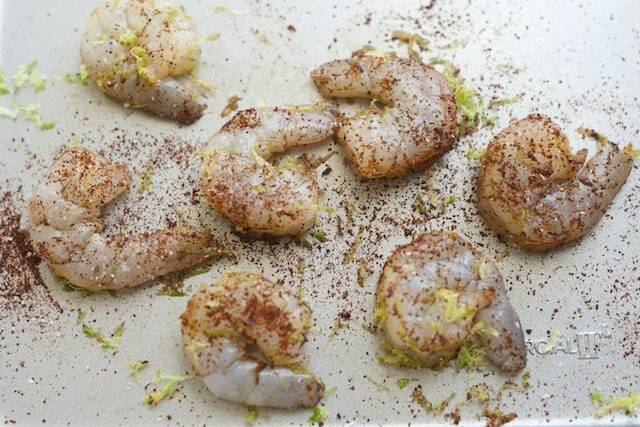 Prepare the Shrimp: Using a microplane, zest the lime. Set the lime aside for serving. Add the lime zest to the shrimp along with the olive oil, chili powder, salt, and pepper. Toss then arrange on a baking sheet in one layer. Bake until the shrimp are opaque throughout, 8 to 12 minutes. Prepare the Lime Sour Cream: In a small bowl, stir the sour cream, lime juice and salt together. 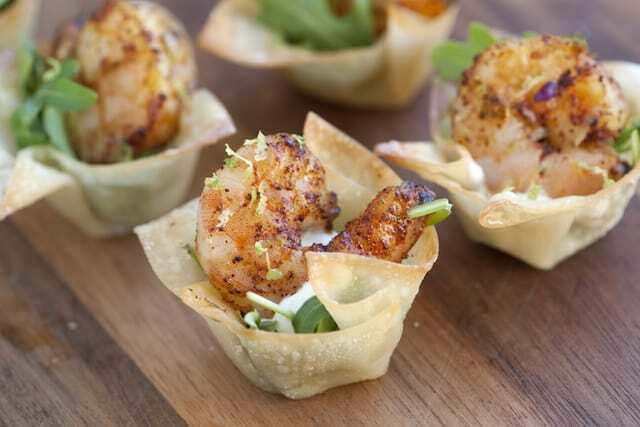 Assemble the Shrimp Cups: Fill the cooled wonton cups with a few leaves of arugula, a small dollop of lime sour cream, and a chili-lime shrimp. Serve with lime wedges for spritzing on top.